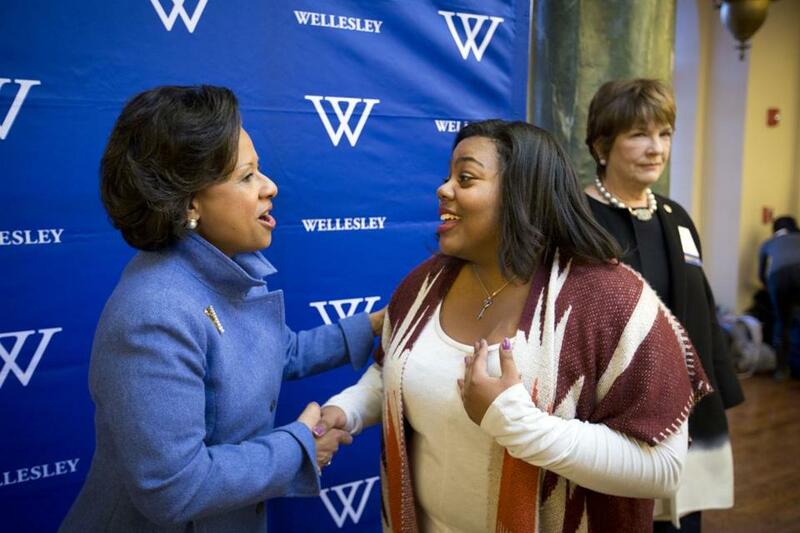 Wellesley College sophomore Gabrielle Taylor (right) greeted Paula A. Johnson, the school’s new president, during a reception after Johnson addressed students at Alumnae Hall on Thursday. Wellesley College announced Thursday it had appointed Dr. Paula A. Johnson, a Harvard Medical School professor and advocate for women’s health, as its president, making her the first African-American to lead the school. Johnson will become the 14th president of the women’s liberal arts college in July. She replaces H. Kim Bottomly, who said in April she would step down after nine years. Johnson, 56, said in an interview that she felt a special responsibility as the college’s first African-American leader and believes that student diversity is one of Wellesley’s strengths. Wellesley graduated its first African-American student in 1887. In 2014-2015, the most recent academic year for which data are available, the student population was 5 percent black, 9 percent Hispanic, 22 percent Asian, and 6 percent biracial or multiracial. Another 12 percent were international students. On campus Thursday, the appointment resonated with sophomore Gabrielle Taylor. “For someone who looks like me, a black woman, to become president of Wellesley College — it is so inspiring to me. She truly embodies black excellence,” said Taylor. Johnson said that Wellesley has important work to do in preparing students for both the great expansion of leadership opportunities for women and the ongoing disparities in women’s employment and health care options. “Wellesley could not be more relevant today in terms of its role in providing an outstanding liberal arts education, which we know is so critical to developing the next generation and to the future of our world,” she said. A committee of students, alumnae, trustees, faculty, and staff unanimously recommended Johnson after an eight-month search. “Even among a superb group of candidates, Dr. Johnson stood out through her record as a scholar and leader, together with her passion for women’s advancement, education, and well-being, the energy and insights she conveyed in our discussions, and her enthusiasm for Wellesley,” Debora de Hoyos, chairwoman of the search committee and a college trustee, said in a statement. Johnson is the chairwoman of the Boston Public Health Commission, a professor at the Harvard T.H. Chan School of Public Health, and a physician at Brigham and Women’s Hospital. She attended Harvard and Radcliffe colleges and trained in internal and cardiovascular medicine at Brigham and Women’s. She is the daughter-in-law of a Wellesley alumna and lives with her husband and two children in Brookline. She currently serves as the chief of the Division of Women’s Health at Brigham and Women’s and is founder and executive director of the hospital’s Mary Horrigan Connors Center for Women’s Health & Gender Biology. Johnson’s work has focused in part on biological differences between women and men, seeking to correct a longstanding imbalance in medical research that looked only at men, she said. The women’s college west of Boston has about 2,400 students and counts former secretaries of state Hillary Clinton and Madeleine Albright among its graduates. Johnson said many Wellesley students support Clinton’s presidential campaign. Wellesley made headlines last year when it announced it would begin accepting transgender women in the Class of 2020, following similar policy changes at women’s colleges such as Mount Holyoke in South Hadley and Simmons in Boston’s Fenway neighborhood. Johnson said it was a policy change that students, alumni, and the college leadership had embraced. Dina Rudick of the Globe staff contributed to this report. Jeremy C. Fox can be reached at jeremy.fox@globe.com. Follow him on Twitter @jeremycfox. Correction: A earlier version of this story referred to Dr. Paula A. Johnson as the former chairwoman of the Boston Public Health Commission; she still holds that post.